Back on Monday, Verizon confirmed that the HTC Droid Incredible 4G LTE would finally launch on July 5th. While it wasn’t that long ago, there was a holiday between now and then that was most likely filled with some adult beverages. So, just in case you forgot, your friends here at PhoneArena just wanted to take a minute to let you know that there were no hiccups and the HTC Droid Incredible 4G LTE did make its way into Verizon Wireless stores today. In addition to an unnecessarily long name, this handset also sports a 1.2 GHz dual-core Snapdragon S4 processor, 1 GB of RAM, 4-inch super LCD qHD display, 8-megapixel camera with 1080p video recording, beats audio, Android 4.0 Ice Cream Sandwich, and, of course, 4G LTE capabilities. The HTC Droid Incredible 4G LTE is currently accompanied by a $50 online discount making it just $149.99 with a new 2-year contact on Verizon’s website. Not sure if this little guy is for you? Be sure to check out our comprehensive review to see how the HTC Droid Incredible 4G LTE stacks up against the competition. Cool story. Now wheres this Razr HD? I tried it out today, feels just like the Rezound. i checked it out today, nice little phone that is. i remember the Incredible and the EVO 4G being really popular phones. Jesus, more GSIII cheerleaders. Just as annoying as the fanatical iPhone fanboys. And soon to be joined by Droid Razr HD nuts. Did it ever occur to anyone that the Incredible was never meant to be flagship but sometihng high end enough for those wanting a more compact phone? 4.8" is quite a bit of kit to carry and hold and the thinness kinda borders on Droid Razr (un) comfort. 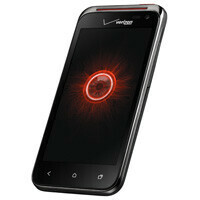 Anyhow, I'm sure the new iPhone and GS III and Droid Razr HD will be good phones but unfortunately Verizon wants everyone off Unlimited data ASAP. I could live with 4GB monthly data but 2GB is kinda cutting it close as I already used up 2.2GB and I have 8 days left of the billing period. Hey...I may be a soon to be GS3 and RAZR HD nut...lol. I agree with ya tho. :-) Ppl are looking at the screen res and ram and thinking its nothing special.I think its a decent phone. I just prefer Amoled screen alot now. But...I might still get it. I want my family plan to be diverse, dont want all Moto phones on it. You dont consider the Rezound high end? The Incredible was too when it launched. Dont know about the T Bolt...and too tired to check n see...lol. For what it's worth, the store manager was really annoyed with Verizon Corporate and the taking away of my Unlimited made no sense to him, despite it being a different device the transaction was supposed to be part of the Worry Free. Now we know why Verizon pushed back the release dates of many phones. oh no, she's unlimited. i misread and thought you got em to do it. i guess i'll just have to do a trade on the forums. i'm sure there's someone who would jump for that with the SIII's popularity. I was typing on my phone and was still very annoyed so maybe some things didn't come through clearly. Anyhow, the GS III is still a great device, though not as solid feeling and has some GPS issues (friend of mine has his), would you really be willing to do such a trade? I wrote a complaint to Verizon since there were several cases of people managing to do the Worry Free exchange without affecting their Unlimited Data plans. I'm not an HTC fan.....and I dont consider the Inc 4G a so-so phone. I think ppl are hung up on screen res and 1GB ram. Still has newer cpu/gpu and newer lte hardware. All that could mean bettery battery life than the Rezound without sacrificing performance.